This is my first cooking post - yay! Although... 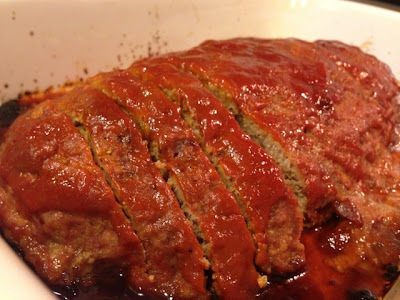 I did not take pictures of every step.. haha, oh well... anyway, I am excited to share with you an amazing recipe for turkey meatloaf, courtesy of Kristy from Sweet Treats and More. Meatloaf can be boring, but to me, it's comfort food and delicious at anytime of the year... even during the hot, hot summer that we are experiencing in San Diego. Sprouts Farmers' Market was offering a great deal on their ground turkey, so I bought two pounds worth from the meat counter for $2.29 a pound. I just love how they wrap up the meat in butcher paper. Just like a gift... of meat. 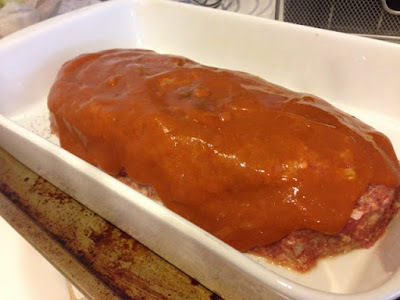 When we got home, I searched "turkey meatloaf" online and browsed through Ina's recipe and others until I found Kristy's recipe on her food blog. The recipe calls for exactly two pounds of ground turkey and I had all the other ingredients needed at home, so bababooey.... I made it. Preheat oven to 350 degrees. In a large bowl combine the ground turkey, egg, onion, milk, bread crumbs, and salt and pepper (I use my clean hands to combine). Using hands form into a loaf and place in a lightly greased 9 X 13 in baking dish. Sprinkle top with another dash of salt and pepper. In a separate bowl combine brown sugar, mustard and ketchup. 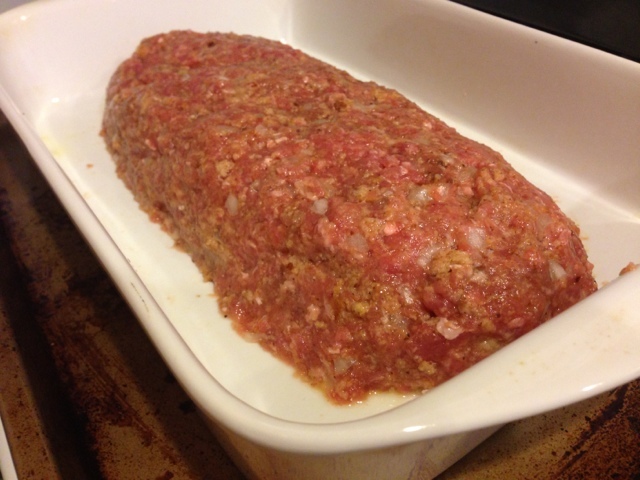 Pour over the top of the meatloaf, spreading evenly. Sprinkle a little bit of brown sugar over the top of sauce. Bake for about one hour or until cooked through. I did not have any canned bread crumbs at home, but I did have slices of whole wheat bread. I made my own bread crumbs by taking four slices of wheat bread and putting them in the toaster oven for about 10 minutes on 250 degrees. Then, I used my food processor to grind them all up. Reading the reviews before actually prepping the meatloaf, some cooks thought that one onion in the meatloaf was too much so I only did a half an onion, which seemed like a lot after it was chopped, but I think that I will put in the whole onion next time. I don't mind a little onion-y flavor! The recipe mixture called for salt and pepper in the mixture, so I basically put three large pinches of kosher salt and a few large shakes of ground pepper. It was the perfect amount. One hour later on 350 degrees, here it is... I'm telling you. 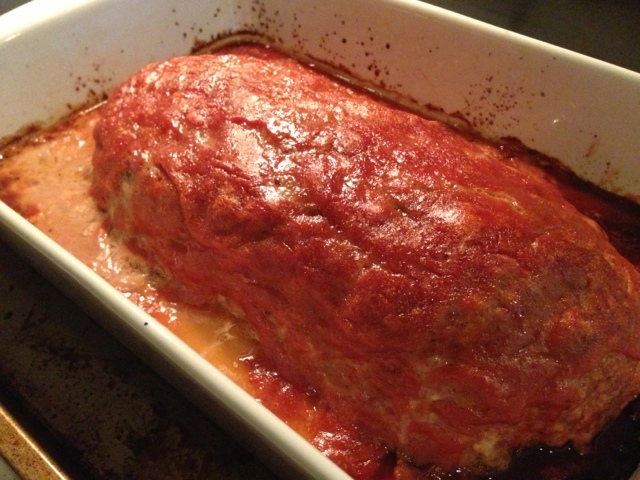 The fragrance of the meatloaf filled out house, and it was tantalizing and teasing us! I should have lined my 13 X 9 ceramic pan with foil. *note to self* ....and to you! It just took me quite a while to scrub every bit of caramelization off my nice pan. 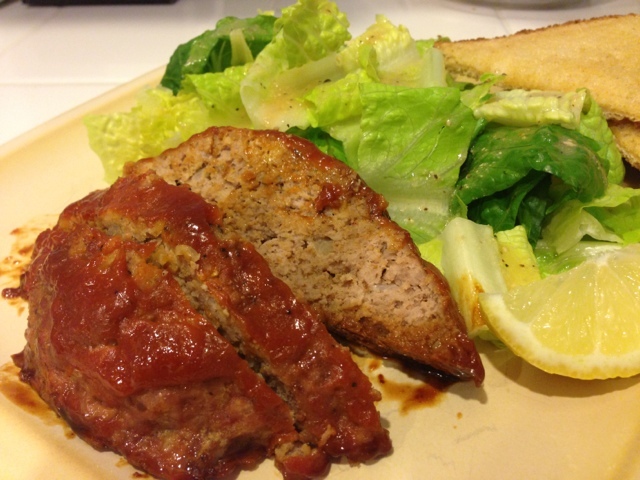 I was too lazy to make an accompanying starch dish, so I made garlic bread and a Caesar salad instead. The meatloaf was SO flavorful. I ate it with ketchup on the side. Kristy recommends that you double the sauce recipe for serving the sauce on the side later. I tend to "underestimate" the baking times because of my oven, but I wanted to ensure that the turkey was cooked all the way. Baking it for one hour was good and it was cooked through, but I think I can achieve more moisture if I took it out maybe five minutes earlier and let it rest. I will do that the next time. 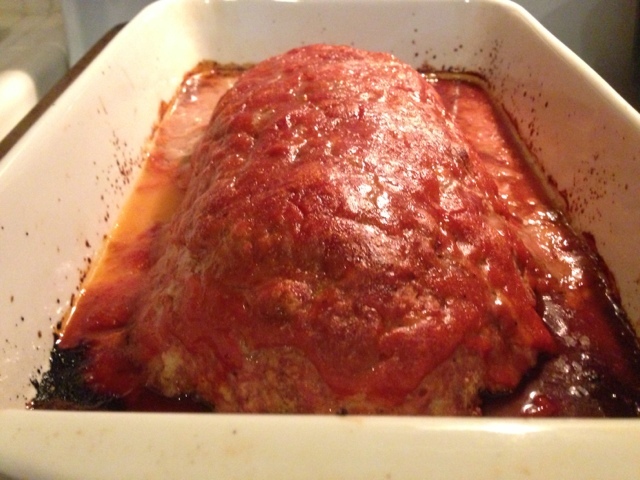 Gosh, I am so grateful to Kristy for posting this wonderful recipe. It is simple, NO HASSLE, and super duper delicious. I made myself a meatloaf sandwich the next day and it tasted wonderful cold too. Try it... you will be thankful too!